Can DIY super and robo-advice mix? Robo-advice – which involves using algorithms and digital tools to deliver investment advice – is one of the emerging trends in financial advice. It has the potential to lower the cost of advice, especially for investors with simple needs. But is it appropriate for self-directed investors? If so, what’s its best use in an SMSF’s portfolio? According to Ian Dunbar, founder and director of Afiniation, a specialist in the global automated advice industry, robo-advice covers two distinct approaches. The first is digital or automated advice. “These services use technology to gather information about the client, such as building a complete profile of assets and liabilities, spending and savings patterns across superannuation and non-super. These tools will augment this with online fact finding and ask a series of questions to establish goals and attitudes to risk,” he explains. The tool then provides recommendations to the client, including whether an SMSF is right for the investor, insurances the investor should consider and strategies as transition to retirement. It may also recommend products or manage the execution of the strategy. “These tools offer great options for SMSFs to receive advice at a much lower cost than visiting an adviser, which opens up advice to the high proportion of SMSFs that do not employ any form of financial adviser. It might recommend the investor seek advice from a human adviser when the client’s situation is complex and discussion with an adviser would be appropriate,” Dunbar says. The second type of robo-advice is automated investment advice that is more limited in scope. This service seeks to understand the client’s goals and undertakes a risk profile of the investor. Dunbar says these services could be appropriate for an SMSF trustee who does not wish to undertake research and make individual investment decisions, but also does not want to incur the expenses of an adviser, managed fund or platform. According to Greg Einfeld, director of SMSF specialists Lime Super, robo-advice can provide guidance to SMSF members around contributions to super, commencing pensions and investing their SMSF assets, as well as how much they can afford to spend each year, when they can afford to retire and how to invest outside super. As an example, he uses a single female aged 62 with $500,000 in a super accumulation account with high fees, a mortgage of $200,000, as well as $200,000 in a high interest bank account, who plans to retire in three years. “A good financial adviser would recommend that she pays off her mortgage using the money in the high interest account, rolls over to a lower cost super fund, salary sacrifices more of her salary into super, commences an account-based pension using the $500,000 in super and invests her super appropriately, according to her risk tolerance,” Einfeld says. “The advice would be provided by way of a document called a statement of advice, which will set out these recommendations and explain how to implement them,” he says, adding that a robo-advice service can provide exactly the same output as a human adviser in regards to these recommendations. Einfeld says at the moment Australian robo-advisers only provide advice in relation to investments and don’t cover budgeting, cash flow management, choice of super fund, contributions or account based pensions. But this is about to change with the upcoming launch of capitalU, which will provide comprehensive advice. Chris Brycki, founder and CEO of Stockspot, one of the local automated advice firms, predicts automated investment services are likely to become more popular as the average SMSF balance falls and there are more younger, time-poor SMSF trustees. “The growth will also be driven by a greater number of older SMSF trustees realising how tricky and time consuming it can be to manage an investment strategy and the associated administration,” he argues. However, it’s important to acknowledge robo-advice is not appropriate for every situation. Dunbar notes investors using robo tools must understand the boundaries of the tool. “Where the situation of the SMSF may be more complex the automated tool may not take all of the circumstances of the SMSF beneficiaries and trustees into account,” he warns. For example, an automated investment tool may not know whether the investment portfolios that it recommends are compliant with the investment strategy of the SMSF. “Investor should always undertake their research and ensure they understand the boundaries of robo-advice,” he suggests. “The adoption by SMSFs will be gradual at first and then rapid. 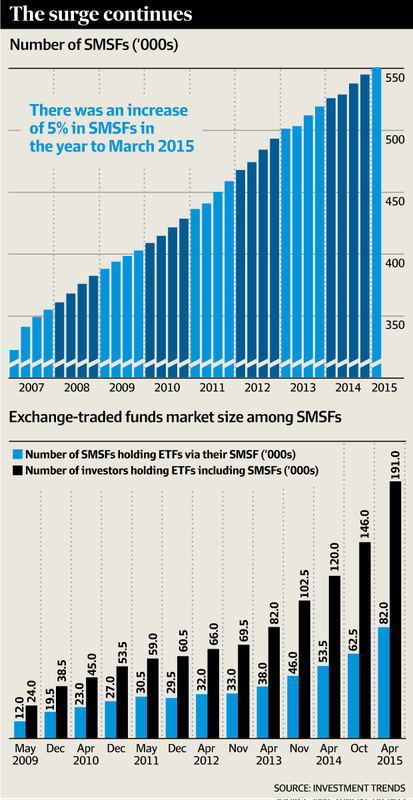 It will mirror the slow start of the ETF market In Australia, which is now experiencing exponential growth,” he says. In terms of how the use of robo-advice will change over time for SMSFs, Marcus Evans, head of SMSF customers, Commonwealth Bank, notes SMSFs can be complex, and personal advice will remain important where trustees are considering sophisticated investment strategies and products and managing related compliance requirements. “We expect to see a move towards higher frequency of one-off automated advice, with more SMSF investment strategies built around a robo-advice model with scaled personal tailoring,” Evans says. “This presents an opportunity for investors to customise the asset allocation in their portfolios and, when combined with personal advice, trustees can achieve greater diversity through investments outside the domestic equity market,” he says.